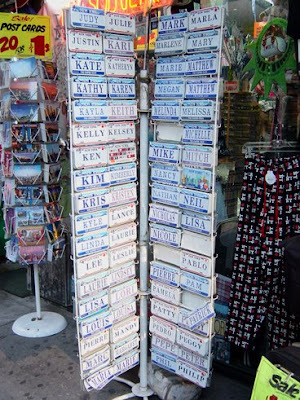 Well, these are the names of those heretofore unnamed tourist passers-by, according to the cheap mini license plate stock: Pierre, Mitch, Kelsey, Kari, Katheryn, Pablo, Marc, Lori, Pepe, Neil... it's all a smattering of outre Europeans and American suburbanites. It looks like the least popular names (meaning most plates leftover) are Peggy and Judy - because ladies with those names are probably sensible enough to be in Disney World on vacation, getting engraved crystal Epcot Centers. Anyone who purchases one of the shirts below knows what they've gotten themselves into. 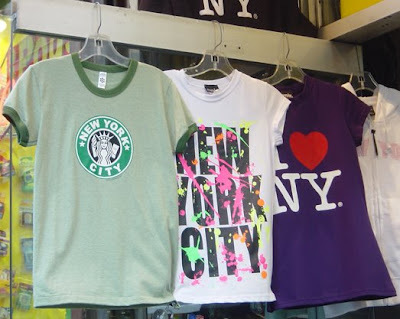 Especially that green one - I mean, NYC, Starbucks AND it's American Apparel? I want to hang out with the person who takes that back to Liege, Belgium and shows it off at his local pommes frites vendor. Yes, sir.